• Onions ( sliced) - 1 number. • Garlic ( crushed) - 6 number. • Peanuts - 1/4 cup. • Dry red chillies - 3 number. • Gongura leaves/sorrel leaves - 2 bunch. • Toor dal ( boiled) - 1 cup. • Curry leaves ( chopped) - 2 springs. • Left over water of boiled dal - 1 cup. • Turmeric powder - pinch. Wash gongura and keep it aside. Heat oil in a pan, add mustard seeds, cumin seeds, dry red chillies, peanuts and saute it. Now add crushed garlic, sliced onions, turmeric powder, chopped curry leaves, green chillies, salt and mix well. In the same pan, add sorrelleaves along with left over water of boiled dal and cook it for about 5 minutes. Thenadd boiled dal and cook by adding salt in small quantities (to taste) till gravy looses its mushy consistency. DeliciousGongura Pappu is now ready to serve. Gongura pappu is one of the delicious pappu recipes from Andhra cuisine. 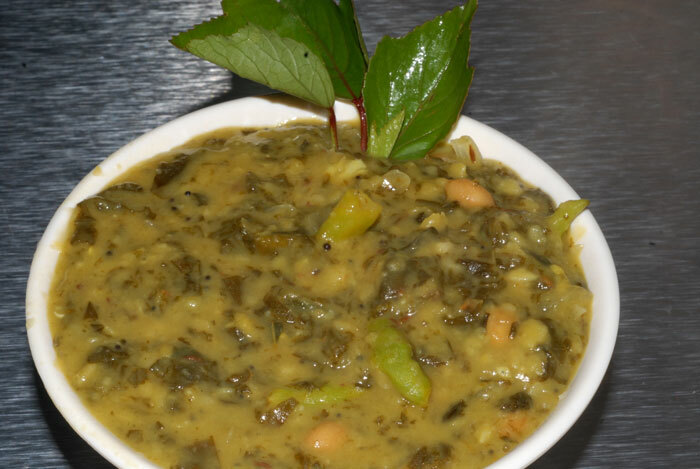 This simple to make dal recipe is one of the best ways to include green leafy vegetables in our daily life. 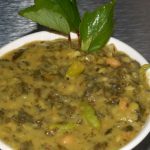 Gongura pappu is a dal (lentil) stew made with sour greens gongura &nbs... Read More..
Gongura pappu is a dal (lentil) stew made with sour greens gongura (a leafy vegetable with a nice sour and tangy taste). The gongura green are cherished in Andhra cuisine more than any of its other green leafy vegetables and is used to prepare delectable pappu, pachadi and other dishes. In Andhra there is no dish that can get more quintessential and authentic than a gongura preparation. The gongura pappu is one of the most favorite dishes among many in Andhra. Gongura (hibiscus cannabinus) is an edible plant grown in India. There are two varieties of gongura leaves available - the one with the red colored stalks (Erra gongura - the red one) and the other with the regular greenish colored stalk (Tella gongura - the white colored one). They impart their characteristic sourness to the dish and so one need to be careful about adding any other sour agents to gongura preparation. Gongura leafy vegetable when cooked with dal (lentil) or pickle has a very distinctive sour taste of its own which wakes up palate, more like zings the taste buds and makes you crave its unique taste. It tastes great with rice or jowar roti. Best way of course is the combination of this dal mixed with rice, ghee and papad. While it has many culinary uses, the most popular is the Gongura pickle. It is widely consumed all over Andhra Pradesh, Guntur. Gongura is more popular in hotels, restaurants, eateries and food joints. Gongura is also known as Puntikura in the Telangana region of Andhra Pradesh. Gongura is a very rich source of Iron, vitamins, folic acid and anti-oxidants essential for human nutrition. Similarly, this leafy vegetable is also popular in Tamilnadu and called pulichakeerai in Tamil. The famous combination with "pulichakeerai" is "Ragi Kali/ Ragi Mudde", which once used to be a regular food for the people in villages (since these items are easily available in agricultural forms). In the western region of India it is popularly known as the Ambadi bhaaji and called the Sorrel leaves in English. It is a summer crop, and the hotter the place, the more sour the leaf gets. Few of the popular and exotic recipes made with Gongura are Gongura Pappu (Lentils), Gongura mamsam (goat/mutton) and Gongura royyalu (shrimp). In recent times, Gongura Chicken is also being served in restaurants. Gongura and calabash is extremely popular with the Telugu community in South Africa. Apart from the curries there are many varieties of pickles made with gongura such as Pulla Gongura (Gongura + Red Chillies) and Pulihara Gongura (Gongura and Tamarind)finished maths To prepare the gongura pappu, firstly wash the gongura leaves and keep it aside. Heat some oil in a pan. Add mustard seeds, cumin seeds, red chilli dry, peanuts mix well, add garlic crushed onions, turmeric powder, curry leaves, green chilli, and salt mix and now add gongura leaves mix well and cook till oil oozes out. Now add boiled dal and mix well if required add some salt. Combine all ingredients well and let it boil till the right consistency. The dish is ready to serve. It’s a simple mélange of tur dal and fresh gongura, with less use of ingredients, but relies on slow cooking for a rich and satisfying flavor. The key for this recipe is toor dal should not be overcooked, and it should hold its shape. The red sorrel leaves known by various names in India like the gongura, ambadi and pulichakeerai have an earthly and unique sourness in taste. The leaves are bitter, mildly astringent and have an acidic taste, hence Caribbean people prepare an exotic deep red sorrel punch, a sweet fruit drink with a wild sourness from the flowers of this plant. These greens are highly nutritious with many health benefits. They lessen the heat in the body. Red sorrel is used as a herb that helps to cools the liver. They can be easily consumed as salad, sauces, and pickles and in vegetables to reap the full health benefits of this useful herb. I think it's also referred to as Kenaf leaf in English. I even called my local Indian Store to find it. They said they usually have it, but they didn't have it this time. I want to try this dish, but I'll have to try to make it later. oh, and he's right about the glowing faces with the mention of gongura pickle...haha! my parents love that stuff. Vahrehvah , you are my hero. thank you very much. your videos are very informative. When i want to cool something you are the first person we go to. Many thanks for all the efforts we really appreciate it. What are sorrel leaves? Is it available in bangalore?